Sign-up as a Blue Frog registered installer today! Demand for shares in a Spokane community solar installation was so strong, sponsoring utility Inland Power & Light boosted capacity with a second array.The project’s second phase, completed in late March, added a 20 kW ground-mount array outside the utility’s main office off Interstate 90 in eastern Washington. It joins a 30 kW array that went into service last fall.The arrays include all certified Made In Washington solar equipment, including modules by itek Energy of Bellingham, microinverters by Blue Frog/APS of Poulsbo, and racking by SunModo of Vancouver, Wash. Installation was by Brimma Solar of Seattle. “Inland Power was great to work with for the entire project,” said John Harley, Brimma vice president. 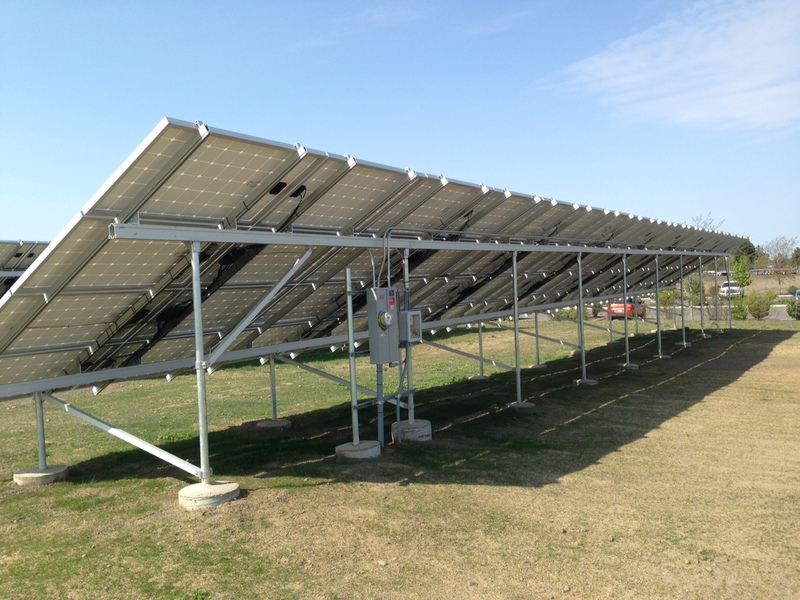 A member-owned utility, Inland Power made units in the solar installation available to its ratepayers through a lottery. “The project sold out immediately,” said John Francisco, chief of energy resources for Inland Power. Unit holders will get credit for their portion of the array’s power production, along with a pro rata rebate from the state under Washington’s Renewable Energy Cost Recovery program. Inland Power & Light serves about 39,000 residential and commercial customers in 13 counties in eastern Washington and northern Idaho. Founded in 1937, it is the largest electric cooperative in Washington. Blue Frog Solar manufactures advanced microinverters under license from APS, a global leader in solar technology. Blue Frog was recently honored by Seattle Business magazine as a top emerging manufacturer in the 2015 Washington Manufacturing Awards. Blue Frog Solar is a Bronze Level sponsor at this week’s Energy/Facilities Connections Conference in Leavenworth, Wash. Hosted by Washington State University Energy Program, the confab runs May 5-7 at the Enzian Inn. This year’s theme, “Staying Smarter than Your Buildings,” considers the need for facilities leaders to keep up with advancements in clean-energy technologies. Facilities design and management and plant operations will be addressed. 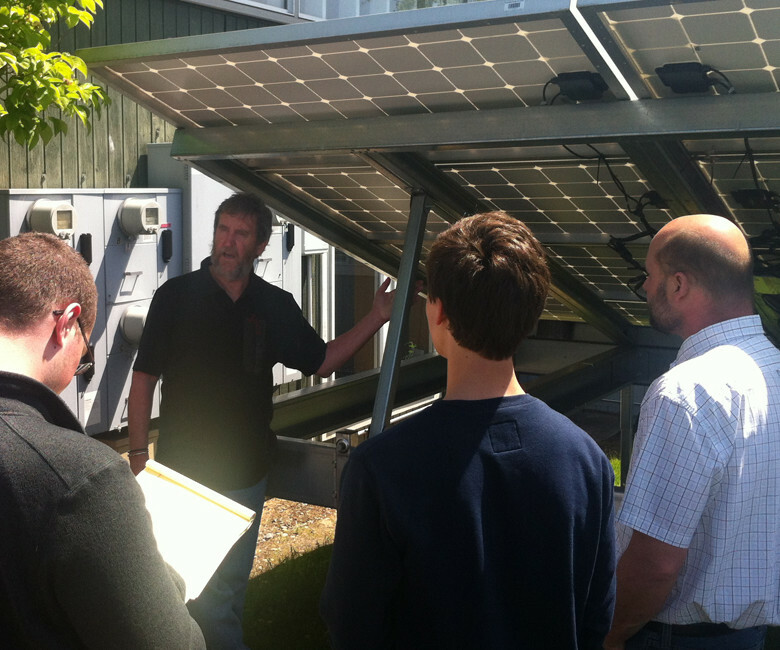 Meet the Blue Frog team at the seminar, or email sales [at] bluefrogsolar [dot] com. Blue Frog Solar has earned a prestigious Silver Award among Washington’s emerging manufacturers. 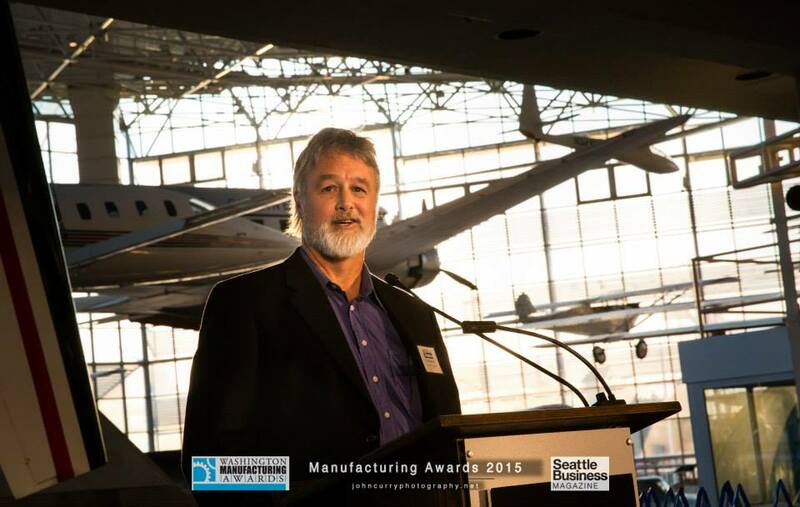 The 2015 Washington Manufacturing Awards were sponsored by Seattle Business magazine, and presented at a gala event April 29 at the Boeing Museum of Flight. Blue Frog Solar manufactures certified Made In Washington microinverters under license from global solar technology leader APS. Honorees in the 2015 Washington Manufacturing Awards were chosen by a panel that included leading executives from throughout the state’s manufacturing and business sphere. Washington manufacturers account for 12 percent of the state’s economy and close to half of all its exports, Helm noted. Bill Virgin, editor and publisher of Washington Manufacturing Alert and a member of the selection committee, said winning businesses in the competition shared a number of traits, including: a continuous record of innovation and improvement; an unwillingness to coast on legacy; enthusiasm for remaking the business, if that’s what customers, the market and competition call for; and attention to detail in internal operations. Winners are also “constantly asking the question, ‘what’s next?’” Virgin wrote. For information on the Seattle Business magazine’s 2015 Washington Manufacturing Awards, see www.seattlebusinessmag.com. Blue Frog Solar was founded in 2011 in Poulsbo, Wash., to bring the finest solar design and technology to the Pacific Northwest. Through the unique Simple Solar program, Blue Frog offers a complete solar financing, materials and installation package for residential and commercial PV systems. The Simple Solar program offers the best pricing, smoothest and most buyer-friendly process for installing Made In Washington solar arrays. See www.bfsimplesolar.com for information. You think of monitoring as an “add-on” rather than an integral part of the system. The homeowner likes to know the solar array is working properly and efficiently, and the installer needs it to help diagnose problems (and possibly gives the installer a way to sell a service package). Some installers do not include monitoring in their installations, which leaves both installer and homeowner flying blind. Make monitoring a priority. You install the gateway device in a poor location. Communication units that relay module performance data need to be sited properly to facilitate strong Power Line Communication between the PV system components. You set up the communication unit incorrectly. Always make sure to designate inverter numbers and configure local grid parameters properly, to prevent crosstalk with other systems in the area. You don’t know your local codes and jurisdictions. Some inspectors may be using 2008, 2011 or 2014 NEC codes, based on state adoption. This could affect the connections and any safety measures needed. Always make friends with the inspector. Look for Blue Frog Solar on the NW Green Home Tour, April 26 in Seattle. We’ll be onsite at the amazing Ballard Emerald Star Net Zero Home, built by our friends at Dwell Development. Located just blocks from Ballard’s vibrant cultural core, this beautiful new home is topped with itek Energy’s Washington-made solar panels (using Blue Frog microinverters, of course) and will feature net-zero energy consumption, earning credits for energy sent back to the grid. We expect this to be a very popular stop on the tour, with a gourmet food truck and maybe even ice cream – come by for lunch! Meet the Blue Frog team and find out more about our Simple Solar program, and how you can put the power of Washington-made solar to work for you. Find out more on the NW Green Home Tour and Dwell Development’s outstanding Ballard Emerald Star Net Zero Home right here . Blue Frog Solar has been selected for honor by Seattle Business magazine in its annual Washington Manufacturing Awards competition. Blue Frog is one of three finalists in the Emerging Manufacturing Company of the Year category for 2015. The top awards will be announced and winners feted at a gala dinner April 29 at the Museum of Flight in Seattle. Bainbridge Island-based Blue Frog produces certified Made In Washington solar microinverters under license from APS, a global leader in solar technology. Microinverters are a key component of residential and commercial photovoltaic systems, converting the DC current generated by rooftop solar panels into AC current useable by households and the general grid. 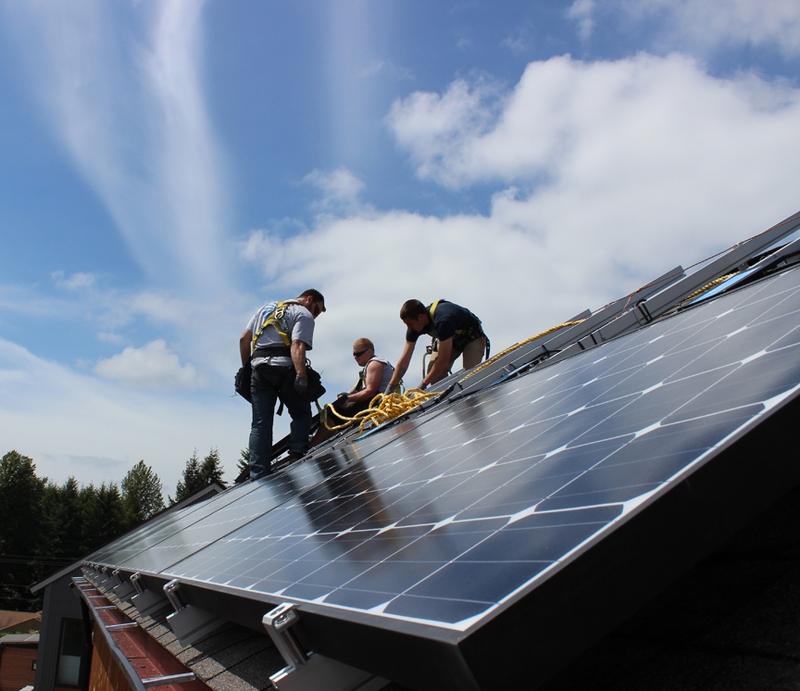 Blue Frog has also teamed up with Puget Sound Cooperative Credit Union and area solar vendors to offer the Simple Solar program, a complete solar financing, equipment and installation package. For information on the Washington Manufacturing Awards competition and gala event, see www.seattlebusinessmag.com. For information on Blue Frog Solar, see www.bluefrogsolar.com. We’re pleased to announce that we’re partnering with APS America on A+ Rewards, an outstanding new rebate program that will give you cash back for purchasing your Blue Frog/APS microinverters. Every APS YC500-MIW microinverter you purchase from Blue Frog between March 1 and May 31, 2015, will earn you $10 back from APS. 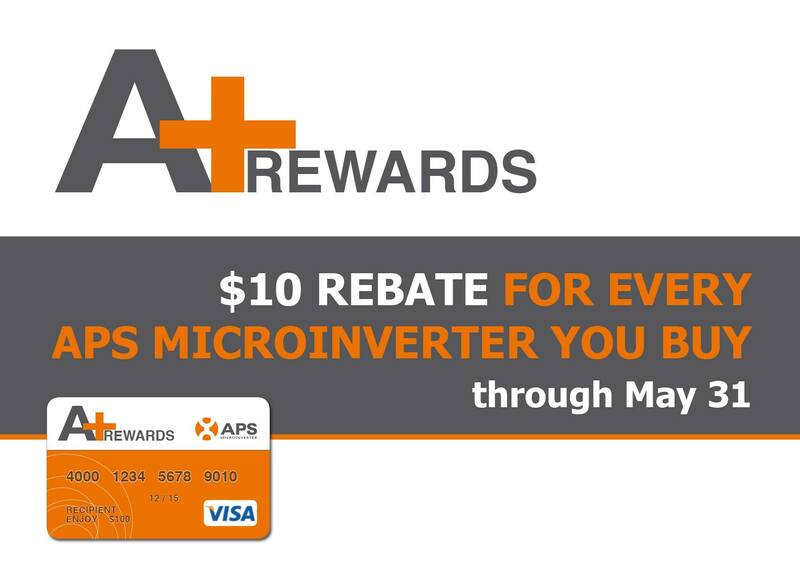 Show proof of purchase through the APS rebate website installer-rebate.aplus-rewards.com, and APS will send you a Visa® Gift Card with $10 value added for every microinverter purchased during that period. Full terms and conditions of the rebate program are available at installer-rebate.aplus-rewards.com, or email aplus [at] apsamerica [dot] com. This is a great opportunity to bring APS microinverters to your customers, and we’re glad to partner with APS for this promotion. Again, the APS A+ Rewards rebate period runs March 1 through May 31, 2015. Place your order with us today to take advantage of this excellent offer. 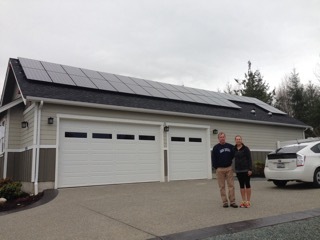 This sleek 9.0kW system is located in the rapidly expanding Nookachamp Hills development in Mount Vernon, Wash. The team at Banner Power Solutions were originally contacted to design and estimate a small PV system to light the entrance of the development. After talking with residents active on the Nookachamp Hills board, owners of this home became very excited about the environmental and financial benefits of solar for themselves. They decided to move forward with their own project using 33 itek 250-watt modules and 17 Blue Frog YC500-MIW microinverters. “They were very excited about using the Bluefrog/APS online monitoring service to watch their system produce some serious power,” says Eric Hull of Banner Power Solutions. Blue Frog installers should know that APS has added a new video, “YC500 Microinverter and Energy Communication Unit Installation,” to its lineup of training resources. The training video supplements current webinars for APS installer certification, and can be found here. 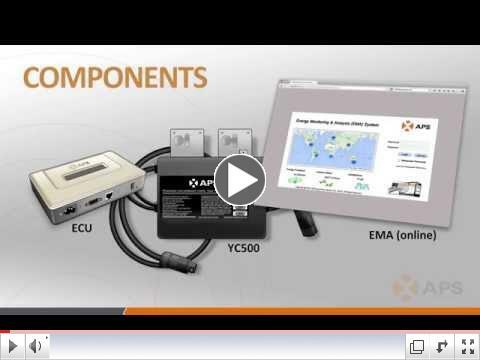 This video fully explains the YC500 microinverter installation process and provides basic setup of the Energy Communication Unit. Subsequent videos will cover ECU programming and Energy Monitoring and Analysis registration and management. Keep up to date on best practices for installation of Blue Frog/APS microinverter systems. Solar’s the way to go, and simple’s the way to get there. 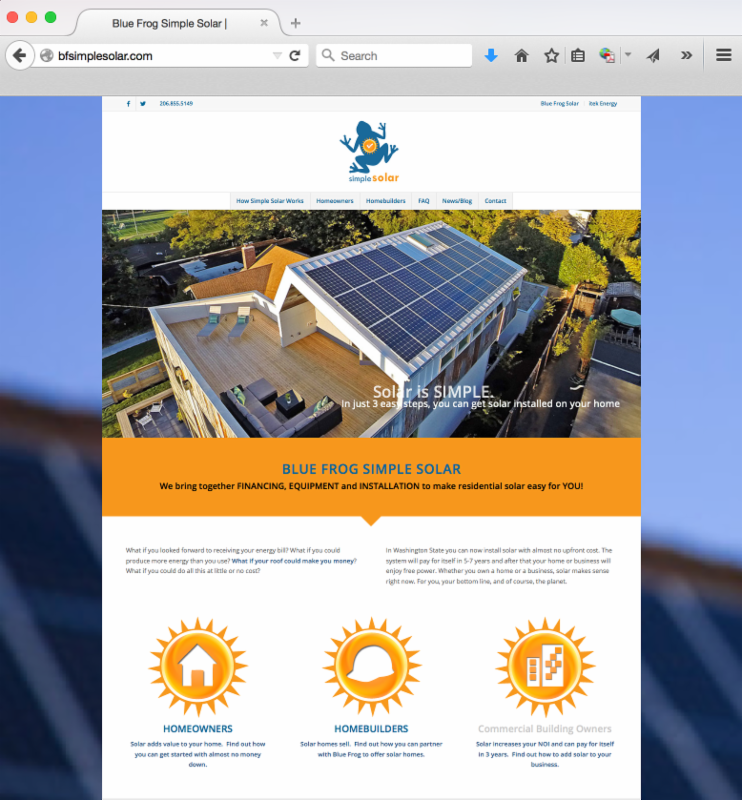 Blue Frog is leading the way with a new website for our Simple Solar program. You’ll find everything you need to sell solar to homebuilders and homeowners. The website is a one-stop shop financing, equipment and installation. Check out www.bfsimplesolar.com and see what Simple Solar has to offer – and pass the link along to anyone you know who’s thinking of going solar. Blue Frog’s got the all-in-one package they’re looking for. Blue Frog Solar, LLC has made reasonable efforts to provide accurate and timely information about the products on this site, but you should not assume that the information provided is always up to date or that this site contains all relevant information available about the products featured here.